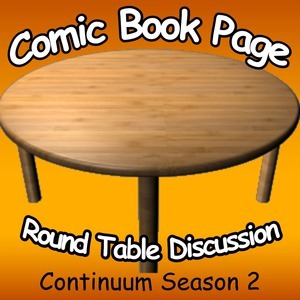 John Mayo, of ComicBookPage, and Kay Kellam, of PopArtsPlace, discuss the second season of Continuum. The entire discussion contains spoilers for the first season but the first part of the discussion is spoiler free for the second season. Starting about 18 and a half minutes in, there are major spoilers for the second season. This entry was posted in Podcast, Podcasts, Review, Television and tagged ComicBookPage, Continuum, John Mayo, Podcast, Rachel Nichols, Review, Season 2, Stephen Lobo, Tony Amendola, Victor Webster on September 25, 2013 by Kay.